This is the first time that I have participated in the Blogger's Quilt Festival over at Amy's Creative Side and I could not be more excited to share a finished quilt. 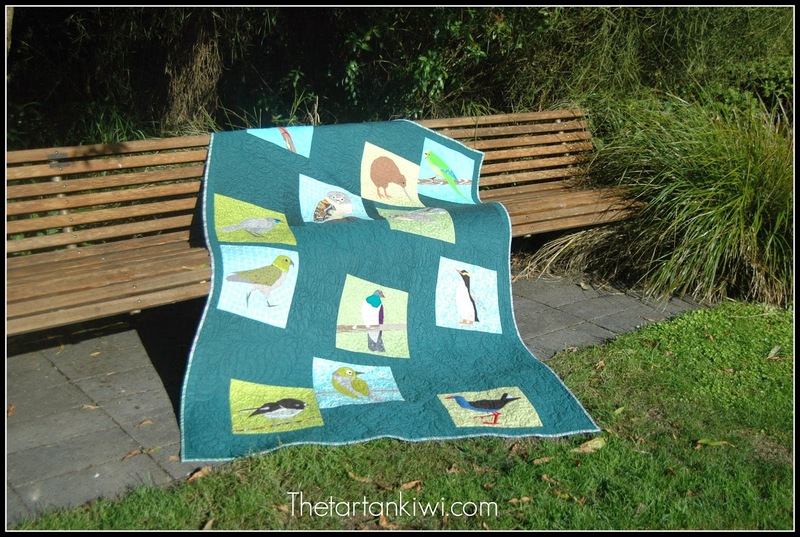 May I present to you my New Zealand Bird Quilt which I am entering in the Original Quilt category. 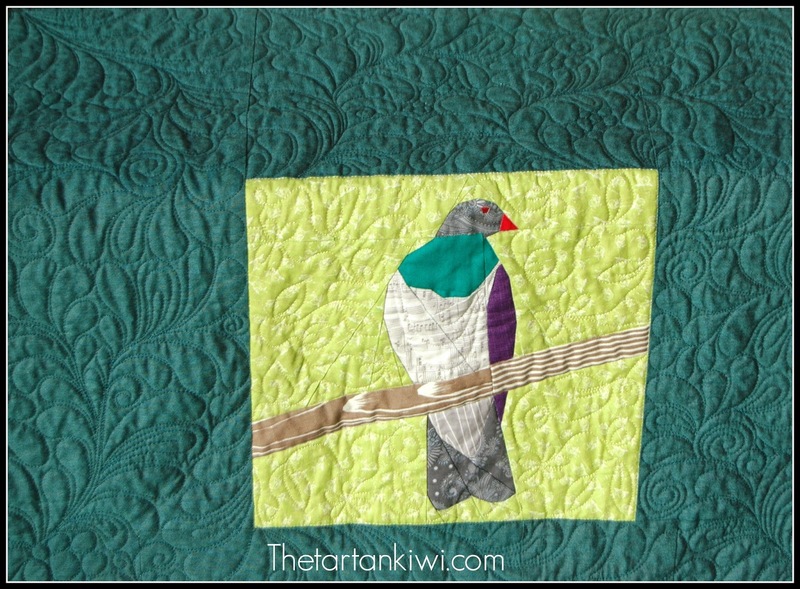 When I first designed my paper pieced Kiwi pattern, I would never have imagined that it would lead to the creation of this quilt. 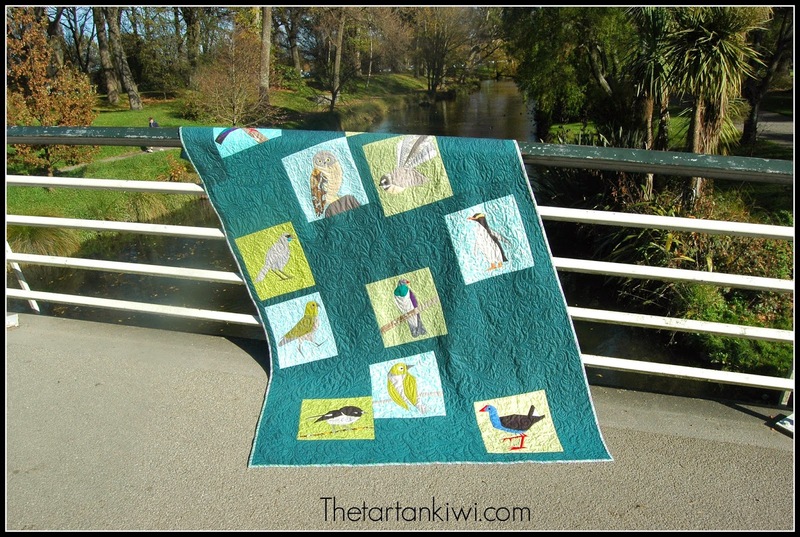 The Kiwi pattern led to a Pukeko pattern which led to the Kea pattern which in turn led to a total of 13 New Zealand bird blocks. Twelve of these blocks have been used in this quilt. At a certain point, I realised that I was amassing a pile of random tester blocks and that I needed to do something with them. I decided to turn them into a quilt. 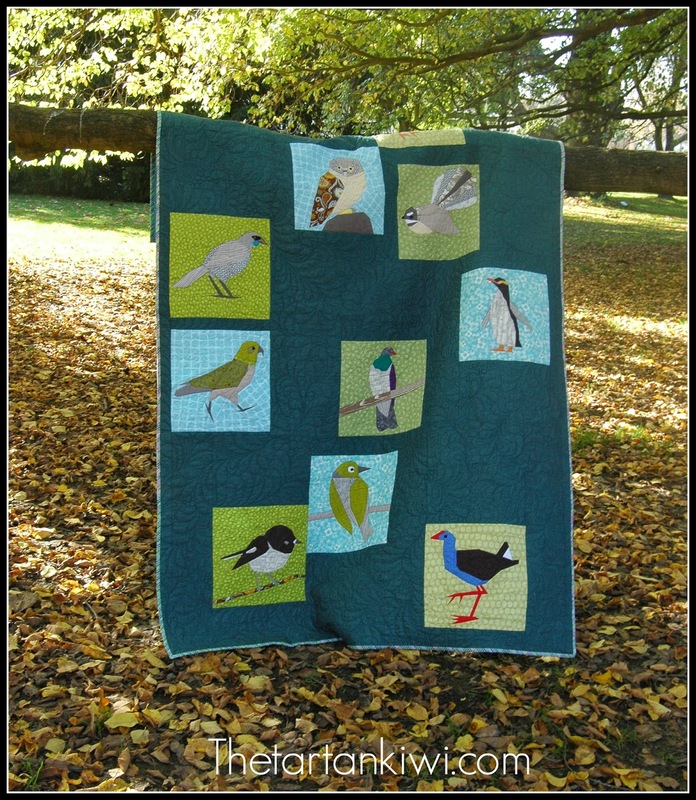 Each block had been made with fabrics chosen to represent the individual birds. There was a certain amount of overlap in the fabric choices, but each block had a different background fabric- some blue, some green. If I had started with a plan I would probably at least have chosen to give all the blocks the same or similar backgrounds, but as I had little choice, I just carried on the blue and green theme. 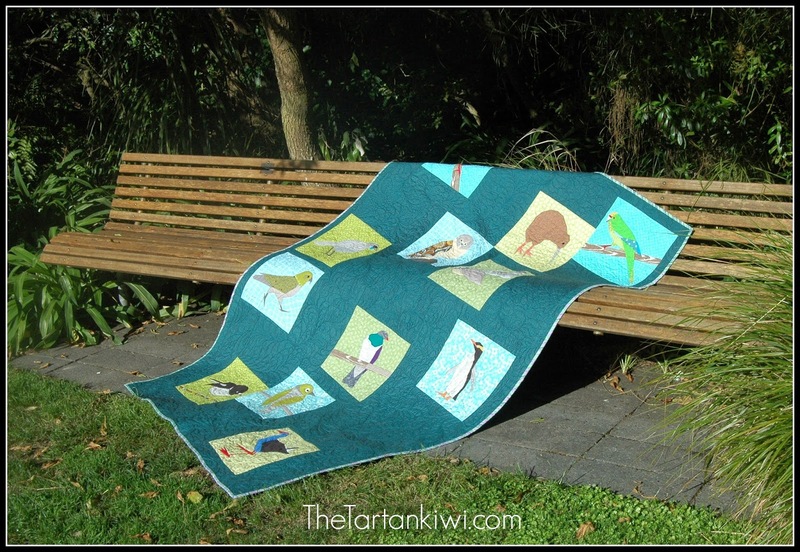 When I was almost finished with the quilt, I was chatting to my friend Roz and she asked me if I was going to arrange the birds in a grid. When I confirmed this she said something like "oh", gave a polite nod and the conversation quickly moved onto other things. Her reaction got me thinking- why cage nature? Wouldn't it be better to have a more natural, organic layout? In the end I did a bit of improv piecing. I love how it turned out- Thanks Roz for inspiring me! I was thrilled with the pieced top, but scared that I would botch it up with my dodgy quilting skills, so I saved my pattern sales money and sent the quilt to Leeanne. It was worth every single penny- she did an amazing job! Just look at all those ferns, berries, flowers and leaves- stunning isn't it!? 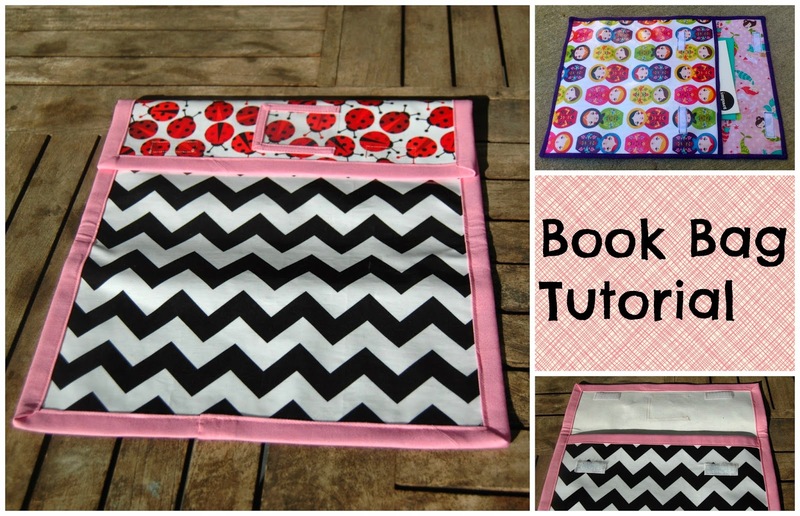 Thank you Leeanne for your beautiful work it really makes my quilt extra special! It's taken me a while to take these photos, but I'm sure that you'll agree that it was worth the wait! 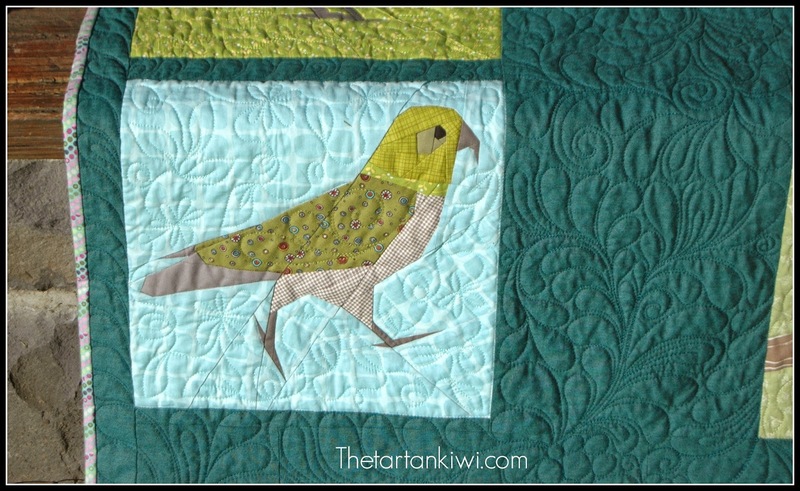 All the bird patterns used in this quilt can be found in my craftsy store. 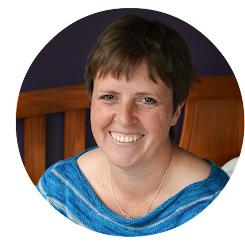 I'm going to link up with my good friend Leonie on Thursday. this is FANTASTIC! I love every block & the layout is perfect. Lovely to see your quilt again! you took some nice photo's. Good I hope you win! Oh, wow - great work! It's almost like a bird-watching guidebook. Love the quilting, too. Wow, this quilt is incredible! Amazing work! 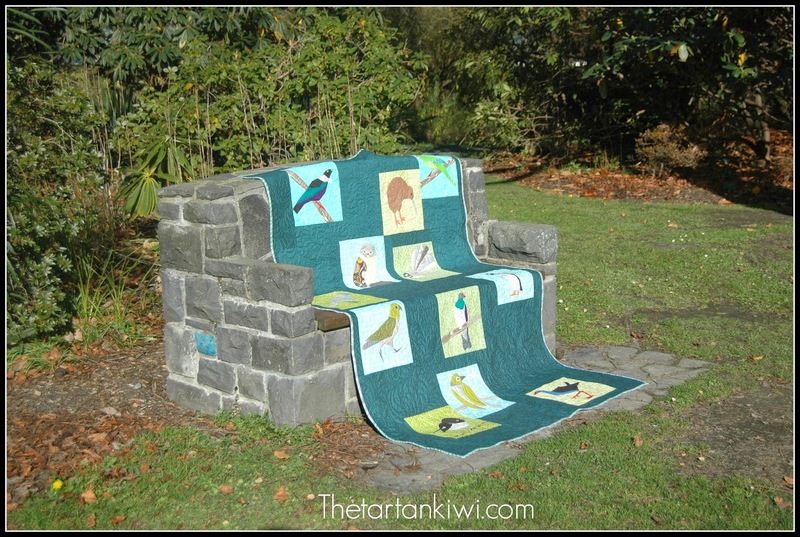 I like this layout and the quilting is amazing. It's beautiful! I love the layout! The whole grid thing can be boring/predictable. You made the absolute right choice! This is beautiful! I also enjoyed watching all the birds as they were being made. These are such intricate pieces and the quilting is stunning too! A stunning quilt, Juliet!!! I really like the different backgrounds of the blocks, rather than having them all the same. You are one clever lady. I've been watching the progress of this quilt via Instagram... it is just BEAUTIFUL!